Homeowner associations can no longer fine residents who stop watering their lawns or take other conservation measures during droughts under state legislation passed recently. While yards must still be maintained and neat – eliminate dry grass and weeds that might be flammable – there’s no requirement to keep a lawn green or even to keep the lawn. We ‘lost our lawn’ the last time a 20 percent water reduction was required to preserve this very limited and precious resource. Although the earth is comprised of over 70% water, 97% of that is salt water, 2% is frozen in ice caps and glaciers, which means only about 1% is fresh water available for human use. My husband and I still chuckle whenever we see somebody spending their weekend mowing their lawn. And, while the drought has made it acceptable and even trendy to be ‘Brown’, going ‘lawn-less’- doesn’t have to mean being colorless. 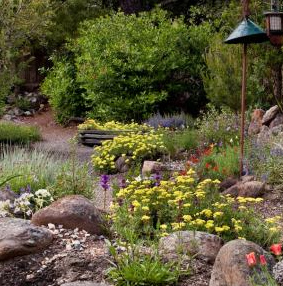 Check out this lovely gallery of native and drought tolerant gardens posted by the East Bay Municipal Water Utility District (EBMUD) https://www.ebmud.com/water-and-wastewater/water-conservation/lawn-goodbye-landscape-gallery. We found the EBMUD publication Plants and Landscapes for Summer-Dry climates of the San Francisco Bay Region an invaluable resource during the plant selection process. EBMUD also has a resource list http://www.ebmud.com/sites/default/files/pdfs/LRP%20resources.pdf of local nurseries, demonstration gardens, classes and events, and books where you can learn about and view native plants. Additionally, some local nurseries will design a lawn conversion planting plan for a fee and then rebate the fee as credit toward plants purchased. Looking for other ways to lower the water impact of your yard? Instead of using fresh, drinking water in your yard, consider a gray water system – safely and legally. Reusing the water that usually goes down the drain after bathing or laundry can keep your landscape healthy and recharge our depleted groundwater sources. 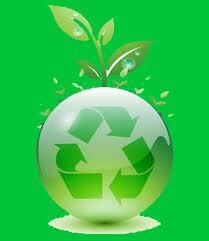 Up to 80 percent of indoor water can be captured and reused as gray water. EBMUD offers rebates to offset the costs of installing hardware, equipment and systems that result in predictable water savings. Learn how you can save water and dollars, regulations, health and safety, soaps and products at a Gray water workshop sponsored by EBMUD on Wednesday, August 13th or Wednesday, September 10th. Even if you’re not ready to go native, you can save dollars by watering your lawn deeply instead of daily. It’s also best to water in the early morning hours before dawn to give the soil and plant roots adequate time to absorb the water instead of being evaporated by the sun first. However, it’s best not to water at night to prevent fungus and disease that is encouraged in the wet of foggy nights. For more helpful instructions, check out this helpful guide from EBMUD. The Environmental Protection Agency (EPA) and East Bay Mud (EBMUD) have many more water conservation resources on their websites. To learn more about how you and your family can conserve water, please visit EPA and EBMUD, respectively. 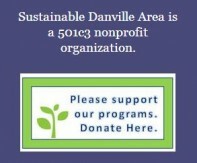 Let us know if you have questions, write to us at sustainabledanville@gmail.com or join the conversation on Twitter or Facebook: @greendanville and www.facebook.com/sustainabledanville.com Post a picture of your ‘lose the lawn’ project and tips you have for our followers.